Early detection catches small leaks before they turn into serious water damage. NOTE: The tasks and timings shown here for your Plumbing are based on a single-family home (owned), located in Massachusetts, United States, with priority set at ‘1 star' or higher, for all possible goals. If you set your personalization differently in your Home Wizard app, then you may get reminders for different tasks and timings in your recommended home care program for your Plumbing. 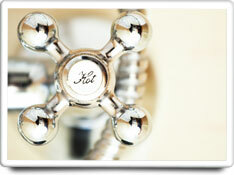 Check inside bathroom vanities and under kitchen sinks for moisture and other signs of leaks. Carefully inspect pipes for condensation or slow drips. Look for rust or white lime deposits which are early indications that a leak is starting. Check for cracks in the toilet bowl rim where it is bolted to the floor. A hairline crack usually means that the toilet is on its way to developing a leak. Also inspect around the toilet for leaks in the water inlet pipes or tank bottom. In addition, look for dripping faucets, leaking shower heads, and malfunctioning toilet flush valves. The benefits of this task are very high. Doing this task can help prevent serious damage from water leaks and pests, which can be very costly to eliminate and repair damage from.